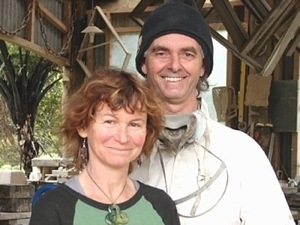 We have developed our contemporary New Zealand nature sculpture business since 2000. 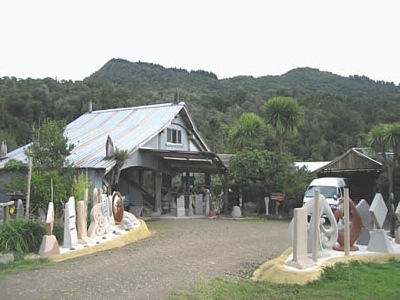 We concentrate on creating sculpture that will enhance New Zealand garden landscapes, be they coastal, bush, urban or rural. Our design range includes totems, panels, combinations of taller pieces on stands and complex sculptures that are interesting from all angles. Most pieces can be handled using just one or two people. We feature original designs that incorporate a range of both literal and abstract themes. These include landscapes, ocean, river, birds, trees, ferns, mountains as well as some human images. All sculptures are personally handmade. The lightweight concrete composite material is crafted to a stone-like quality, and often includes mixed media such as copper, stone, NZ paua shell and glass. Carving and different finishes give textural effects, contrast and visual interest. from Doubtless Bay in the Far North of New Zealand. Our 155 hectare Permaculture land project that we began in 1990 has edible landscapes, native forest conservation, sustainable forestry, and eco buildings hosting visitors. Our workshop runs on solar and hydro power. We gain inspiration from the surrounding natural landscape with its streams, native bush and coastal environment. Paradise Design Sculpture is open by appointment at our workshop in Peria, Far North for those adventurous enough to find us. We often personalise our designs with clients sharing their ideas and their particular situation with us. Please feel free to contact us with your requirements and ideas.